It's finally summer weather here in my part of Ontario and it's hot - not humid though. I don't like humidity and I tolerate the heat - my ideal temp is the mid 20s and cooling off at night. This weather, around 30, is okay as long as it doesn't last for too many days. My a/c is working great and the house is cool so I'm coping well. I've been cleaning up and de-cluttering my house for a while now and I'm into the sewing room. I decided that a good way to help would be to finish up the small projects I find while de-cluttering. It makes the cleaning go slower, but I feel like I've accomplished something. This weekend I've been working on quick and easy finishes - to finish up UFOs and feel like I've got a sense of accomplishment. I finished up this knitting needle case with fabric I bought last fall. This makes the straight needle case - I've already finished the circular and double pointed case. I'm only putting the bamboo ones in here. I thought I had a lot more, but I guess not (unless I find them while cleaning). I really like this fabric and I'm very happy with how they turned out. When I look in the knitting basket I feel like it's better organized and I can find my needles when I need them. I used this pattern and found it relatively easy to follow. I switched around a few steps and didn't make the handles. It calls for bias binding, which is a lot more fabric to buy - I used my regular binding. I did have fairly large pieces of some fabrics left over so I'd double check yardage needed before buying. I think it's because of the sizes of the needle cases, not wanton wastage. I made up these pillowcases for my nieces for Xmas presents. They liked last years ones so I made more. Xmas is a long way off, but I'm often very busy and very tired leading up to the Season. Now I can pack these away (hoping I don't forget about them) and cross one item off my Xmas list. I sort of used a tutorial I found on line. The body is the reindeer and the argyle is the trim. While cleaning I came across a pile of PUL fabric - it's a knit that is waterproofed and used for making your own diapers. 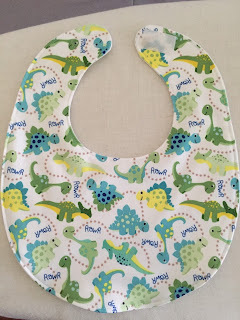 I made up a bib instead. I've asked a few friends with children for feedback on whether the waterproof bibs are useful - does everything just slide off? Are absorbent ones better? Any suggestions? This fabric is super cute (I have a total of 4 different prints) and soft and easy to work with. 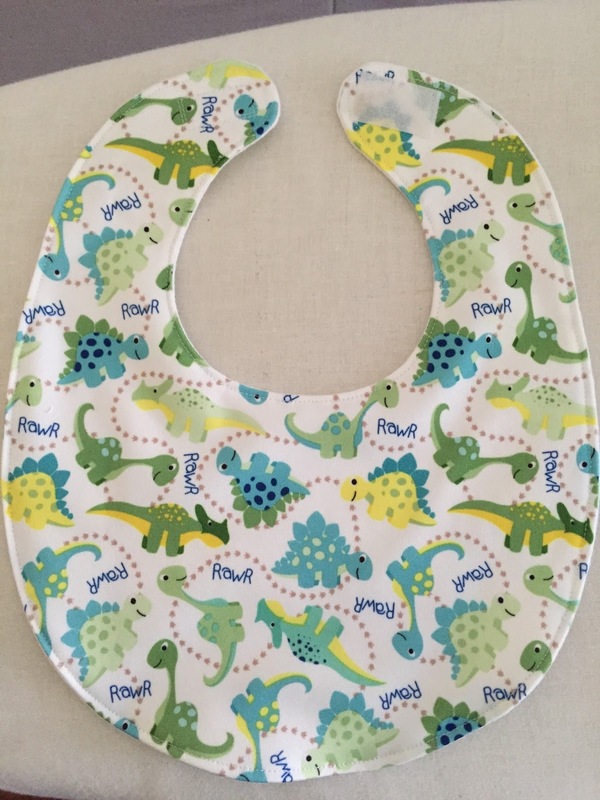 Once I get feedback then I'll either make up more bibs for baby gifts or figure something else out.